Whether it’s Jr. High or college, the students are always given a label. The jocks are known as the cool kids while the smart ones are known as the nerds. It seems so black and white; you’re either one or you’re the other. This really does not have to be the case. 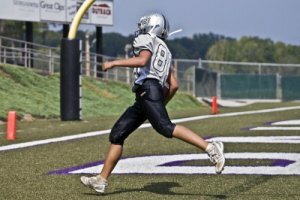 The straight-A student can also be the one who gets a football scholarship. It is possible to juggle sports and academics and excel in both. It comes down to desire, time management, and a whole lot of work, but it is possible. What’s more; it’s worth it. Playing a sport in school helps to get you out of your desk and into the action; it offers a break with major benefits. Staring at a textbook can get awfully exhausting, and being part of a sports team can offer you a much needed break to work out, wake up, and then get back to it. On the other hand, doing well academically can help you to be more focused as part of a team. Academics also helps teach you logic and problem solving which you can put to good use on the field (or court, or whatever the case may be). Plus, if you are hoping for a scholarship in your sport, doing well academically will boost your chances substantially. When managed properly, sports and academics don’t clash with each other at all; they actually complement each other and help you to put all of your hard-earned skills to use. Sports benefit your overall health; mentally, physically and emotionally. By playing a sport, you are providing yourself with a healthy outlet that gives you some stress relief while doing something that you love. Whatever your sport may be, it can allow you to take your mind off of your term paper, grades, and even all that dirty laundry. While it can be demanding, your sport may be the break that you need to help yourself to not feel so bogged down. This is a concept that many don’t quite understand, and is why people are often able to manage sports and academics fairly easily. The academic part is the real job and the sport is your outlet; your break. When you think of it this way, it suddenly doesn’t seem like nothing but work. When you commit to both academics and a sport, you must realize that you don’t leave yourself a lot of time for anything else. While your friends are at a party, you will probably be home doing the homework you didn’t have time to do because you had a game that day. This is perfectly fine so long as both your sport and schoolwork are equally important to you. You also need to be sure that you don’t book yourself solid. Leave a little breathing room in your schedule. While it’s great to be busy and commit to a wide array of different things, if you never give yourself time to rest, you will quickly burn out. If you aren’t working at your full potential, both your schoolwork and your athletic abilities will suffer. Perhaps the most important key to balancing both academics and sports is learning to manage your time. If you can’t make the most of every minute, you will be miserable; there is no room for procrastination in this juggling act. When you’ve got both a demanding course load and a heavy practice schedule bearing down on you, you have very little time to waste. Take a look at your daily schedule and find little ways to fit in more studying, more sleep, and less waste. Perhaps it’s possible to take the bus to school; this would give you extra time (otherwise spent singing to the radio) to study and finish up homework instead of staying up so late at night. With one minor tweak, you’ve earned yourself both more study time and more sleep. You’ve got to learn to make the most of the time that you have. Sit down once a week (Sunday evening tends to work the best) and think about the week ahead. Plan and schedule each thing that you can. Schedule set times for studying and then stick to your schedule. Creating a schedule is much like creating a budget except that you are working with time instead of money. Distribute the time in the most efficient way possible in order to accomplish everything and hopefully still have time left over for relaxing or going out. When everything starts to pile up and you feel yourself wearing down, it’s easy to wonder why in the world you decided to take on both sports and academics. Constantly remind yourself that this is what you wanted and that both things are equally important. Keep a positive attitude and remember that all of your hard work is going to pay off. Also don’t forget to enjoy school and your sport; they are both things that you cared enough about to try and take on simultaneously. Don’t get so caught up in the demand of it all that you forget to enjoy yourself. Very good article, well written!